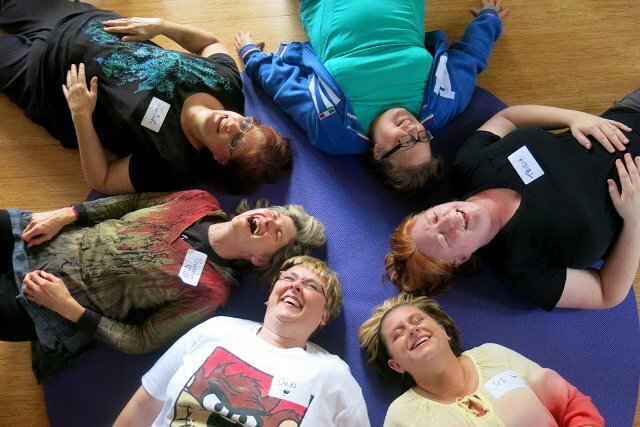 A group of women participate in a session of laughter yoga. A blonde-bobbed woman, about 50 years old, chuckles to herself among a group of strangers sitting in a circle -- her eyes mischievous and child-like. She folds her hands to her mouth, and reddens as if about to erupt with laughter. Her mouth is agape as she cackles and bends her head back in response to the sheer raucousness of the moment. The circle of about 12 people imitates the laugh, and the room, inside Unitarian Universalist Church of Delaware County, suddenly explodes with mirthful laughter. You'd be forgiven for thinking any number of these 12 people (myself included) are crazy. But the simple fact is that they're doing yoga -- well, a form of yoga. And it's not quite what you think. Laughter yoga, for starters, isn't yoga in the traditional sense: There are no mats required, no balance exercises, no sun salutations to speak of. Instead, there are laughing exercises created not to be funny (though they do tend to be), but to force laughter for the sake of deep breathing, which is where the "yoga" portion comes into play. Because of increased oxygen intake from the deep breathing involved with laughter, the exercise is thought to reduce levels of cortisol, what's popularly known as the "stress hormone," and boost endorphins. By association, laughter can regulate blood pressure, relax muscles and, it's been argued, manage pain that comes with diseases like rheumatoid arthritis. Though, the jury is still out on how impactful a fake laugh is as opposed to one that's involuntary. The exercises, of which there are a core 100, were developed in 1995 by Madan Kataria in Mumbai, India, with some tweaks made through the years by any number of the 6,000 "laughter clubs" around the world -- including one hosted by Media, Delaware County's Alexa Drubay. "A lot of people think [laughter yoga] has to do with yoga and expect it, thinking they're going to do yoga poses. But I try to explain to everyone it’s laughter exercises with deep yoga breathing," Drubay told PhillyVoice. "It complements regular yoga." Though classes do start and end much like a yoga session, opening with a philosophical explanation of the practice (in short: lighten up), and finishing with an abbreviated version of the Shavasna deep-breathing meditation. The middle, meanwhile, feels a lot like experiencing an elementary-level music class all over again, mixed with aerobics and, of course, laughter. At different points of the hour-long session, I found myself peeling an imaginary banana, conducting an orchestra, shaking up an imaginary cocktail, singing "This Little Light of Mine," wiggling my body against a classmate and acting out my own laugh for others to repeat. It is, at its heart, an experience that's about finding joy in the absurd, familiarizing yourself with your body, connecting with strangers and embracing distraction -- the latter being the point when the activity stops feeling ridiculous and starts feeling like stress relief. And while I faked many laughs at first, the energy of the room proved so emotionally contagious -- truly, how can you not laugh when middle-aged men and women next to you guffaw while making monkey poses -- I could hardly tell which laughs were real or fake by the end. If its blissful effects were phony, I was happy to live in ignorance. It's not just an experience that's recommendable for frown-face skeptics; it's practically built for them. The quirky experience, on a local level, comes courtesy of Drubay, a 54-year-old who explained she seldom smiled or chuckled before she discovered laughter yoga -- first in 2010 when a cousin introduced it during a family reunion, and again in 2014 during a journey through the Googlesphere. 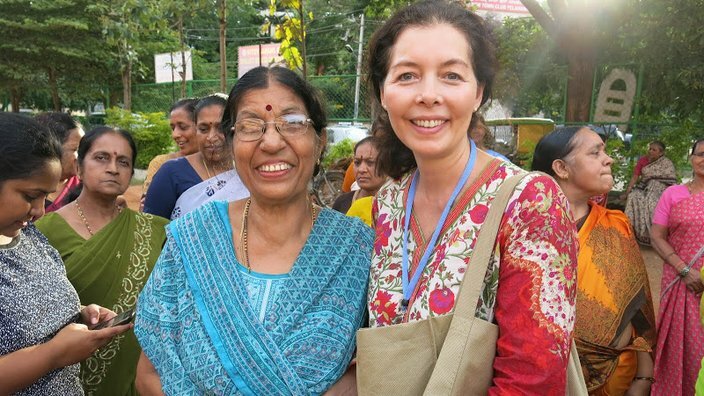 Inspired by the purported health benefits of laughter, she took a spontaneous trip to India to meet Kataria and train to be an instructor. "There are hundreds, maybe thousands of laughter clubs there," Drubay said of her experience there, adding that it's a 7 a.m. ritual for some people. "They have them not only in parks but at businesses. Because they realize the value of laughter yoga in the corporate world: that it helps with stress, improves workers' performance and boosts their health." Alexa Drubay, who instructs laughter yoga sessions in the Philadelphia region, traveled to India for a laughter yoga certification. She offers free classes at the Unitarian Universalist Church of Delaware County on Sundays and Mondays. Her goal, she said, was to start her own club locally as well as bring that kind of stress-relief to workplaces, elder homes and schools stateside -- cultures that are increasingly becoming busier and more serious. That, and to be able to train others to take the wellness practice to other communities. Since hosting her first laughter yoga session at Smedley Park in September 2014, she's conducted about four two-day training sessions out of a studio in her home, consisting primarily of therapists, social workers and nurses from New Jersey, Delaware, Maryland and Virginia. The challenge, she said, is to get skeptics to experience and understand laughter yoga for themselves. "When you look at it from the perspective of ‘This is something I want do for myself,’ and mindfully introducing more laughter into your life regardless of whether something is funny or not, it changes your whole mindset about it," Drubay explained. "You look at it as a workout tool, just like you would lift weights – ‘I’m going to do my daily laughter.’ It's not based on comedy or humor; all you have to have is a willingness to laugh. That value, apparently, extends beyond just Drubay's classes: Cooper Health's Anderson Cancer Center, for example, offers laughter yoga as one of several wellness programs for cancer survivors. "A big, heavy laugh is equivalent to transformational breath work sessions people come to, and it’s a whole lot easier and more fun and no one has to know," Julie Fischer, the practitioner for the program, explained to PhillyVoice. "It expands the lungs and brings air into the whole body in a very gentle way. A lot of times, our survivors have had surgeries and things in those areas -- especially our breast cancer population. So, coming out of the effects of the surgery, the chemicals and such, it helps to detox the body, strengthen it and really move oxygen through. Cancer, she teased, is not a funny subject. So, it provides them an opportunity to release their innate urges to laugh without fear of judgment. "Laughter yoga is built on the premise that there's always the ability to laugh," she said. "We laugh because we can, and not at anybody's expense." Look, there is something inherently ... well, odd about the idea of people gathering to laugh their knickers off for no apparent reason. And it's not for everyone, but it is worth exploring even for people who might otherwise expect they'd hate it. There's something incredibly liberating about finding a safe space to unwind; it's like screaming into a pillow, if that involved circle time and pretend theater with 12 of your closest strangers. But the challenge after, of course, is to translate that tension release into your daily life -- to replace outrage with laughter. The morning after the session, trekking it down Walnut Street during rush hour, I passed a cab just as it turned a corner and into a pond-sized puddle. Sure enough, it splashed a tsunami of water on me, leaving me soaked. My blood boiled, my fists began to clench -- but then I breathed.